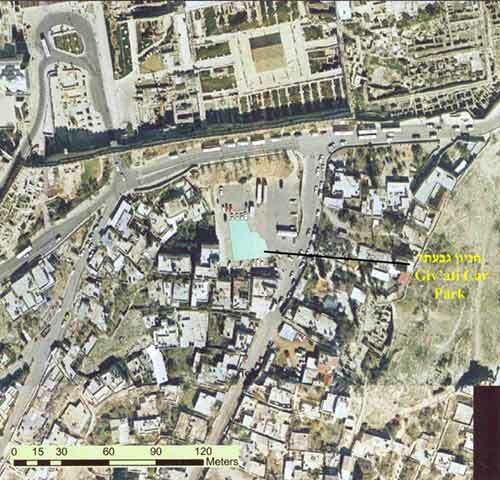 During March–October 2007, a season of excavations was conducted in the City of David parking facility (Giv‘ati Parking Lot; Permit No A-5071; map ref. NIG 22234/63128, OIG 17234/13128). The excavation, carried out on behalf of the Antiquities Authority and funded by the El‘ad Association, was directed by D. Ben-Ami and Y. Tchekhanovets, with the assistance of S. Bachar, N. Nissim Ben-Ephraim, A. Zilberstein and D. Gottreich (area supervision), V. Essman, M. Kunin and M. Kipnis (surveying and drafting), T. Sagiv (field photography), Y. Gecht and M. Cimadevilla (computing), D. Sandhouse (identification of Byzantine pottery) and D.T. Ariel (numismatics). Students from the Institute of Archaeology of the Hebrew University in Jerusalem and other academic institutions took part in the excavations, as well as volunteers from abroad and a group of workers from Silwan and other nearby villages. Special thanks are extended to H. Geva and M. Hershkovitz for their assistance in identifying the pottery vessels. The excavations were resumed in the aftermath of an initial excavation season that was headed by R. Reich and E. Shukron (HA-ESI 117). The excavation area is located on the northwestern side of the City of David spur, along the eastern fringes of the main valley that delimits the spur on the west (Fig. 1). The excavations are part of a multi annual project whereby the entire area of the car park (c. 5 dunams) should be excavated. It was decided to excavate this season approximately one quarter of the area (Area M1) down to bedrock and establish the stratigraphic and chronological sequence and the different periods (Fig. 2). Early Islamic Period. The latest remains uncovered in the area, other than the modern remains from the middle of the last century, dated to the Early Islamic period and included four phases from the Abbasid period and another phase, probably from the Umayyad period. Dwellings and installations discovered in the high, eastern part of the excavation area were part of a residential quarter from the Abbasid period. A system of primary drainage channels, to which secondary drainage conduits were connected, conveyed the settlement’s sewage westward, to the bottom of the valley. The bottoms of the channels and their sides were coated with a thick layer of plaster; their upper parts were covered with stone slabs. An obvious and significant decrease in the characteristics of the settlement occurred toward the end of the Abbasid period and during its final phase, the area was no longer residential and numerous pits were found dug into it. Byzantine Period. During this period, the City of David experienced an impressive building boom. It is evidenced by the construction of large buildings, which occupied an extensive area and were part of a residential quarter that was built along the northeastern slopes of the Tyropoeon Valley. The network of streets and drainage channels passing beneath the buildings attests to the meticulous planning of the area. The earlier of the two Byzantine-period phases (fourth–fifth centuries CE) included a system of large buildings that were distinguished by their planning and impressive foundations, which descended to a great depth, frequently 3 m or more. These foundations formed constructive cells, which were loaded with artificial fill that consisted of soil, gravel and fieldstones. The cells were meant to create artificial surfaces that would facilitate the construction along the western slopes of the City of David spur; they bear witness to the engineering solutions that needed to be devised by the builders of the period. The impressive foundations bore the walls of the buildings, which were often preserved to the height of the doorways installed in them (Fig. 3). The walls of the buildings consisted of different masonry stones than those used in their foundations. The walls were mostly built of dressed limestone and sometimes, large ashlar stones that were dressed in the typical Herodian style, which alluded to their previous provenance, were incorporated in them. The later phase of the Byzantine settlement (sixth–seventh centuries CE) often followed the plan of the early phase, with slight modifications that included the raising of floor levels, the narrowing of entrances and the addition of other elements that did not alter the basic plan of the building. Elsewhere, more fundamental changes, which differentiated between the two settlement phases, occurred. These included the adaptation of some spaces to the course of the wide street that was established in this phase along the upper part of the Tyropoeon Valley. Roman Period. The remains of this period were represented by random finds, mostly fragments of pottery vessels without any architectural features. The complete absence of building remains was consistent with the currently known overall archaeological picture of Jerusalem that shows no Roman occupation within the precincts of the Lower City. Numerous Roman roof tiles were noted among the finds of the period, two of which bore the production stamp of the Tenth Legion Fretensis. The wild boar (Fig. 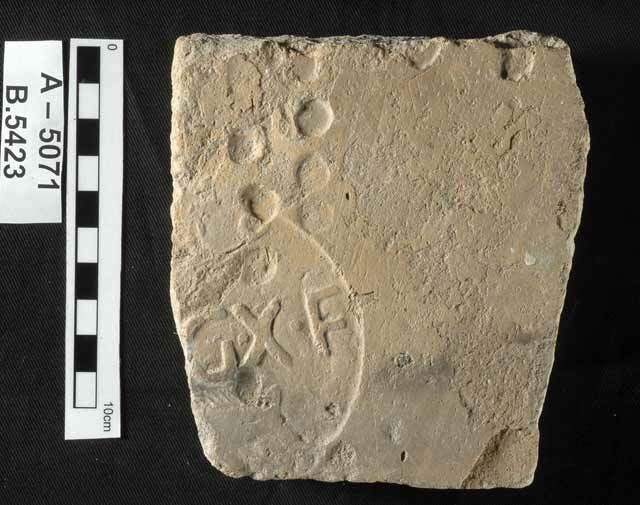 4) symbol of the legion appears on one of the better-preserved stamped impressions. Second Temple Period. 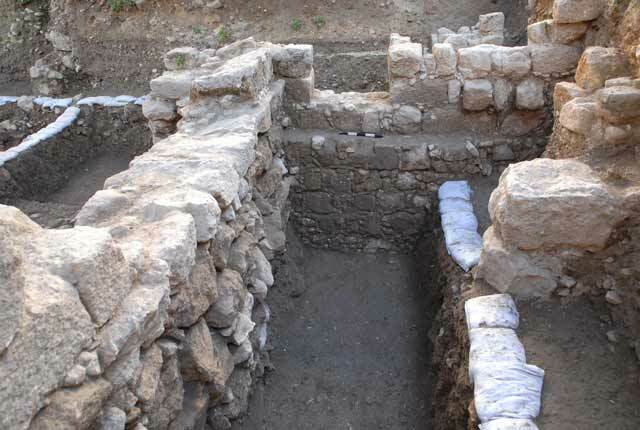 A system of walls and installations that dated to the latter part of the Second Temple period was discovered directly below the complex of Byzantine buildings. This system was part of a large architectural complex that consisted of two main units, a southern and a northern one. A large impressive edifice, whose northeastern corner has only been revealed to date, was in the southern unit. The eastern wall of the building (exposed length over 14 m, thickness c. 2 m, height more than 5 m) was built of large roughly dressed fieldstones, some of which were hundreds of kilograms in weight. The northern wall (width c. 1 m) was also preserved to a substantial height. The interior portion of the building, within the limits of the excavated area, indicated that the structure was divided into elongated halls, oriented northwest-southeast. The eastern part of three of the halls was exposed and an additional hall seems to have been situated to the south. These halls, standing at least two stories high, continued westward beyond the limits of the excavated area. The vaults that composed the ceiling of the basement floor consisted of neatly worked, white ashlars whose bottom courses were preserved in all the vaults of the discovered halls, while the upper stone courses were found inside the collapse of the building’s destruction (Fig. 5). On the interior face of the walls in the story above the vaults, which were also preserved to a considerable height of several meters, remains of the original smooth white chalky plaster that had a different composition than the plaster in the basement floor were still visible. Remains of frescoes, colored in shades of red, yellow and green, with thin black lines, discovered in the building collapse, indicate that the plastered walls were decorated with painted designs. The northern unit was another wing in the architectural complex, north of and next to the building in the southern unit. It included a number of plastered water installations, some of which were ritual baths (miqwa’ot). The installations were dug into the ground rather than quarried in bedrock. Their sides were fieldstone-built walls, coated with gray plaster that is characteristic of the period; it is apparent that more than one plaster layer was applied to them. As in the main building to the south, the entire area of the wing was not exposed, as it extended beyond the limits of the excavation. 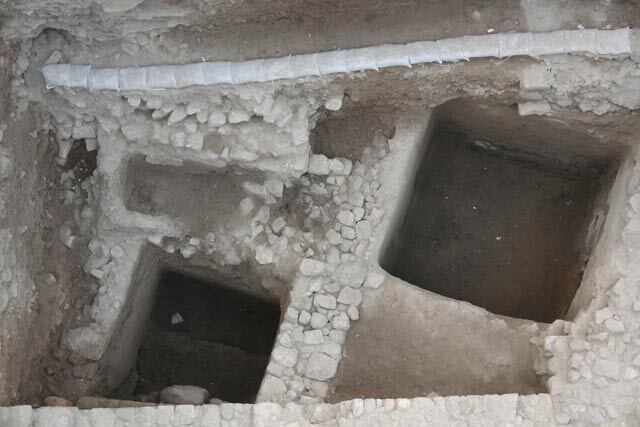 Two complete miqwa’ot and a square water cistern that probably supplied water to the baths were discovered. A plastered bathtub was uncovered next to one of the miqwa’ot (Fig. 6). The building ended in a massive destruction. The enormous fieldstones incorporated in the walls toppled into the structure, bringing down the vaults in the basement floor and the floors of the halls caved in together with the vaults. 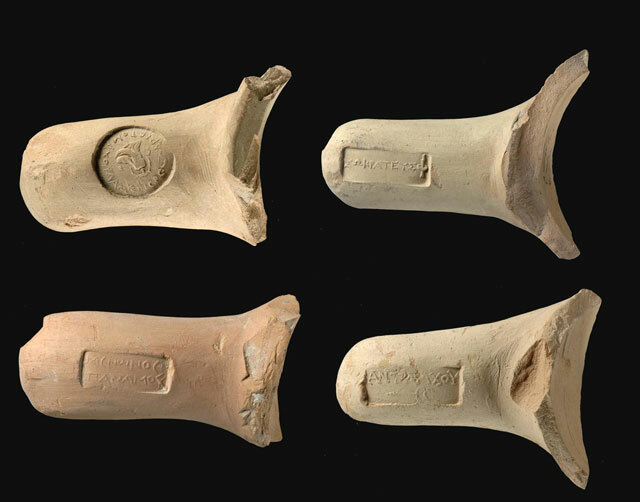 Both the pottery vessels and the coins indicate that the building was demolished in the year 70 CE, with the destruction of Jerusalem at the end of the Second Temple period. Hellenistic Period. The architectural remains from this period included a long broad retaining wall that was preserved to a considerable height (c. 3 m) and floor levels that abutted it on the west. The retaining wall was built of large worked limestone and small fieldstones between them. The earthen fill that accumulated above the floors consisted of a considerable amount of potsherds, which included a wide variety of bowls and a large quantity of imported vessels, primarily Greek black glazed bowls and Rhodian amphorae, 22 handles of which bore stamped impressions (Fig. 7). 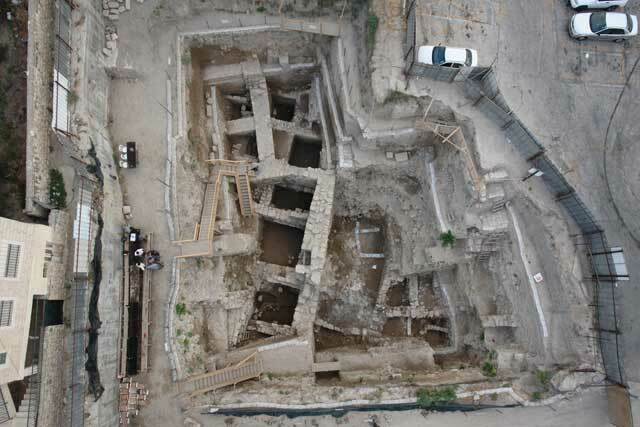 The relative absence of building remains from the third–second centuries BCE in Jerusalem underlines the importance of this discovery. Exposing other remains from the Hellenistic settlement within the area slated for excavation will aide in defining the nature of the Hellenistic settlement in the City of David. Iron Age. The remains of the period, exposed in five strata that represented most of the Iron Age, were founded directly on bedrock, marking the earliest settlement in this part of the City of David. This period was mainly characterized in this area by relatively densely built houses of careless and poor construction. The houses, built of one-stone-wide walls, contained a variety of domestic installations. These indicate a residential quarter that existed in the area during this period. The absence of architectural and ceramic remains from the Bronze Age period is especially conspicuous. With the exception of a small number of potsherds from the Middle and Late Bronze Ages, these periods were not present in the excavation area. 2. Aerial photograph of excavation area. 3. Foundations and walls in one of the Byzantine buildings. 4. Roman roof-tile fragment with production stamp of Tenth Legion. 5. Vaulted basement floor of building from latter part of Second Temple period. 6. 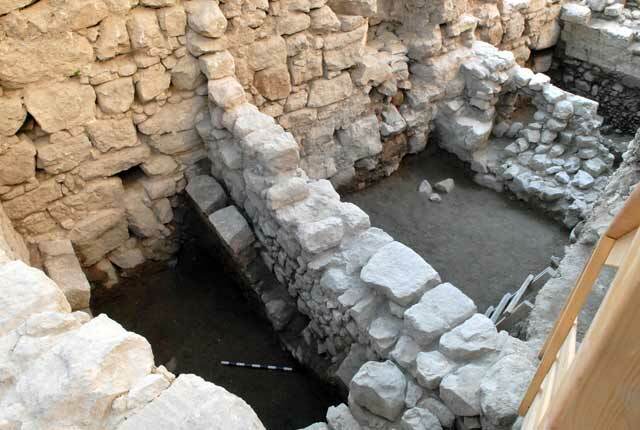 Ritual baths and water installations in northern wing of building from Second Temple period. 7. Stamped impressions on Rhodian amphora handles.